For the last few years I have grown a few vegetables in pots and last year I used Bokashi in the base and was astonished with the results. I had cherry tomatoes continually from mid-July to November and my dwarf beans were also superb. People often wonder what to do with Bokashi once it has had it's 2 weeks fermenting and the majority either add it to their worm bins or just dump it in a compost bin/heap. 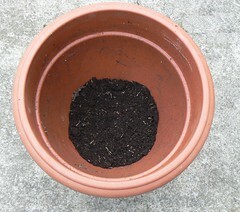 By using it to layer the bottom of a large pot that you then plant some veg in means it works right where you need it. I've just potted on this years cherry tomatoes. I started with a layer of normal potting compost in the bottom, though there's probably no reason you couldn't just start with the Bokashi. 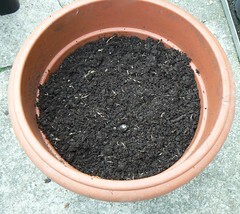 I then added about 3 inches of Bokashi, before filling to about 3/4's full with organic peat free grow bag compost. The idea here is that by leaving a quarter of the pot empty you can top-dress with either vermicompost, compost from your bin/heap or even just more grow bag. The joy of vermicompost and compost is it will act as a mulch during the hotter days. Vermicompost has the added benefit of being extremely high in nutrients as well, and therefore ideal for hungry tomatoes. Once more established these plants (and all my veg) will be fed with a good dose of worm tea throughout the growing season. 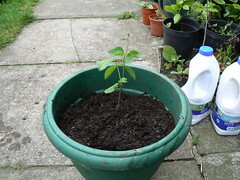 I also planted up a runner bean in the same way. These should probably be grown outside but this one will be grown in the greenhouse. I did this a few years ago and had a surprisingly good crop, but this will is the first time I have done it with a Bokashi base to the pot. I'll post the (hopefully pleasing) results. 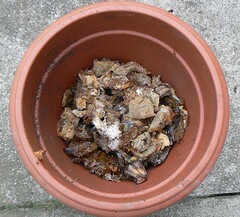 Actually using Bokashi Bins for gardening can give very improved and impressive results. Wow excellent! idea. 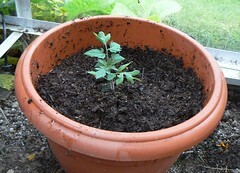 I have also grown a few vegetables in pots. Thanks for sharing your idea. I am planting some vegetable like tomatoes, carrot, potatoes etc. Your compost are very important for this vegetable. I also try to make it.